apartment locator Archives - Find It Apartment Locator , we highlight some of its most stunning attributes – attributes that make it one of the finest places in town. Bel Air Willow Bend is home to some of the most exciting amenities. From providing a beautiful landscape to the trendiest of fitness centers, the apartment facility has a lot in store for you. You can stroll in the nearby parks and when the sun sets, make your way towards the barbecue restaurant to taste some of the most delicious cuisines. If you have kids, this apartment complex is ideal, since it features separate parks for children. Among other amenities, the facility also offers covered car parking and quick on-call maintenance. All of these features combine to provide a comfortable living experience. The apartments include one, two and three bedroom floor plans. You can choose according to your specific needs. Whether it is a spacious balcony you desire or the carpeted floors that you always wanted to have, Bel Air Willow Bend’s apartments have got all the amazing features you could imagine. You can have a separate study room for your kids or store some extra accessories in the spacious store room. These apartments also include vaulted ceilings, wood burning fireplace, electric kitchen, dishwasher and much more. You don’t need to worry if you have a little furry buddy as part of the family. 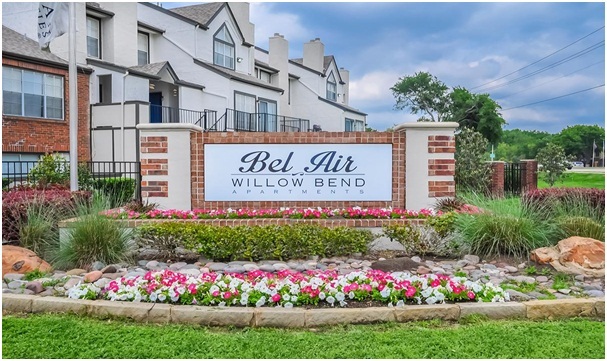 Bel Air Willow Bend is very friendly towards pets. In fact, it allows two pets per apartment. If you are looking to move, Bel Air Willow Bend can be an amazing option. Find It Apartment Locators is a team of exceptional apartment locators in Dallas, Texas and can help you find your ideal home in Bel Air Willow Bend. Few apartments can combine contemporary interior design and décor with superior living amenities and facilities. The Wade Crossing Apartments are among them. These apartments provide convenient residential facilities for all who are in search for a deluxe accommodation. Located in the heart of Frisco, Texas, the apartments will be in close proximity to a range of leisure and dining options along with shopping facilities and provide you with the amenities you need in order to enjoy a wonderful living experience. If you have been in search for the ideal home, using our apartment locating service, you can find a perfect apartment at the Wade Crossing Apartments at Wade Boulevard, Frisco 75035. The very opportunity to live in the affluent city known of Frisco is enough of a reason why the Wade Crossing Apartment Homes defy all odds and fulfill your luxury needs. The apartments are located in central Frisco and are minutes away from some of the most well-known attractions and popular sites. Among these include the Frisco Assisted Living Center, Tuscany Square, Sprouts Farmers Market, and the Frisco Athletic Center. You will be captivated by the various activities you can enjoy on weekends whether it is eating out at fancy restaurants or enjoying shopping in one of the best malls and markets in the area. The apartments are available in one, two, and three bedrooms coupled with splendid interiors. You will have your own private balcony or patio depending on what bedroom apartment you choose along with modern equipped kitchens and considerable living space that will be ideal for inviting friends and family over. The apartments are also furnished with comfortable and quality furniture including but not limited to sofas, television, carpets, and lighting. Furthermore, you will have a private den or study area, a fireplace area, Wi-Fi internet access, and detached garages. In addition to these, you will have the privilege of taking benefit from various recreational facilities, such as a 24-hour gymnasium and swimming pool. Many people who live in apartments say that an apartment complex is only as good as the amenities it offers. Legends at Legacy Apartment Homes don’t disappoint here. The standout amenity is the outdoor oasis that is filled with plenty of water features and aqua lounge furniture to keep you cool throughout the summer. The complex also features a perfectly maintained fitness facility, full service spa, and separate entertainment HQ! There are also a number of bike parks and agility courses spread out throughout the complex, access to high speed Wi-Fi all around in addition to jogging trails for outdoor recreation. The infrastructure perfectly incorporates modern architecture with the warmth of traditional apartment complex styles-perfect to make you feel right at home. For starters, the apartments here at Legends at Legacy boast the largest floor plans in Frisco – yes, you read that right! The apartments are available in single floor options as well as loft style pads that have extra space on top for office use or to use as a cozy chill out spot. The floor is wood-finish vinyl and the countertops are granite, all making up for easy upkeep. All apartments are tastefully decorated with modern accent lighting that makes you feel right at home. The apartments are also loaded with all sorts of modern amenities like appliances, water and ice dispensers and gooseneck faucets. If you are a fan of huge bathrooms, these apartments won’t disappoint you. They also feature walk-in closets and a many other features to give you the apartment lifestyle you are looking for. The apartments here are competitively priced with rental rates starting from $1,237 up to $2,016 for apartments ranging from one to three bed and baths. You can check out all the features and information and detail on the official website. If you are already looking for an apartment locator, start off your search with our services today! Stay tuned for more! Every month, we highlight a new luxury apartment that is worth checking out. This month, we have something special in store for you – The Emerson at Frisco Market Center. The attention to detail, outdoor and indoor amenities, spacious floor plans make this apartment complex one of the top few in our list. One of our personal favorite aspects of these apartments is the high ceiling. The expansive 9-foot ceiling adds a layer of luxury to each apartment which is hard to find. Moreover, all apartments are tastefully furnished with wood vinyl flooring, two tone paint schemes, high quality plumbing fixtures, outdoor terraces, vanity lighting and a lot more. All the apartments also come with full size washer and dryer connections along with garden soaking tubs with ceramic tile bath surround. Simply put, The Emerson apartments are elegantly furnished with each and every feature, you could ask for from an apartment. At Find It Apartment Locator, we believe an apartment is only as good as the amenities and comfort the community offers. The Emerson at Frisco Market Center doesn’t disappoint here either. The community is rich with features like resort style swimming pools with decorative fountains, a courtyard relaxation area, state-of-the-art fitness center with HDTV, pet spa, multilevel parking, individual hot water heaters and professional onsite management. What The Emerson offers to residents as a community is the true definition of luxury apartment living. You can check out the complete list of amenities and features here. The list of amenities and awesome features doesn’t just end here. There are a number of schools within Frisco, namely Griffin Middle School, Wakeland High School and Carroll Elementary. The apartments are neighboring to the future Grand Park and there are also a number of restaurants and popular food chains nearby. With a wide variety of options that allow you to find something that precisely meets your budgets, apartments that are loaded with modern amenities and a community that is the true reflection of luxury apartment living, The Emerson at Frisco Market Center makes it to the top of our list. You can even make all your payments online here. 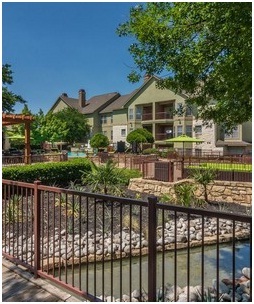 Are you looking for an apartment in Dallas TX? Get started with our Dallas apartment locator and find the apartment you are looking for today! Every month, we introduce you to one of the most outstanding apartment facilities in Dallas, Texas. This month, our pick is the amazing Bel Air Willow Bend. Combining spacious designs with state-of-the-art modern facilities, this is one living place where the earth meets heaven. From wonderful views through balconies to the most effective central heating and air conditioning systems, this apartment facility contains all the elements of great living. Few apartments can combine contemporary interior design and décor with superior living amenities and facilities. The Wade Crossing Apartments are among them. These apartments provide convenient residential facilities for all who are in search for a deluxe accommodation. Located in the heart of Frisco, Texas, the apartments will be in close proximity to a range of leisure and dining options along with shopping facilities and provide you with the amenities you need in order to enjoy a wonderful living experience. 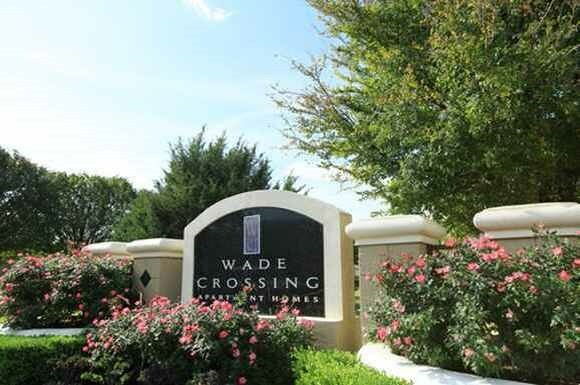 If you have been in search for the ideal home, using our apartment locating service, you can find a perfect apartment at the Wade Crossing Apartments at Wade Boulevard, Frisco 75035. Every month, we highlight an apartment we come across that we feel our viewers should definitely check out. Keeping up with the monthly tradition, we have something very special in store this time. Say hello to Legends at Legacy Apartment Homes. With designer touches, spacious floor plans and a lifestyle to perfection, this apartment complex is among the few top ones on our list. With a massive square footage and a completely serene environment, it houses a number of residents who prefer to live in style. Every month, we highlight a new luxury apartment that is worth checking out. This month, we have something special in store for you – The Emerson at Frisco Market Center. The attention to detail, outdoor and indoor amenities, spacious floor plans make this apartment complex one of the top few in our list.